The radiant and beloved masterworks of leaded glass from the Gilded Age. Louis C. Tiffany’s intricate and brilliantly colored masterpieces have captivated collectors for decades, and continue to inspire crafters who re-create them in home workshops today. This collection showcases eighty of the firm’s most iconic lamps, including rare and one-of-a-kind creations. These examples have all been newly photographed in sumptuous detail to reveal features in the glass and metalwork that have never been seen before in print. Intricate patterns dazzle with kaleidoscopic fantasies: wisteria that twists and curls with grace, peonies that explode with color, and dragonflies that dance with the light. Uniting a reverence for nature and a fascination with the artistic potential of glass, Louis C. Tiffany and his designers created a revolutionary design aesthetic that brought the beauty of the natural world into the home. 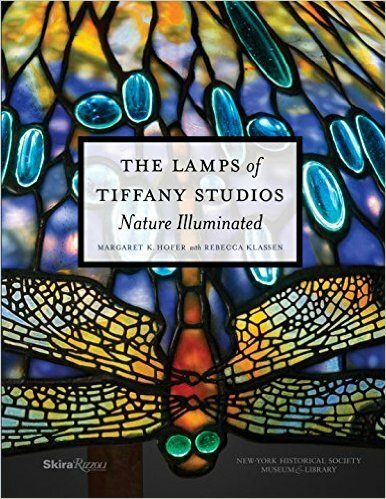 This book explores Tiffany Studios’ innovative adaptation of electric light: sheathing the incandescent light bulb in a shimmering veil of leaded glass. Beautifully designed and produced in an intimate format, The Lamps of Tiffany Studios presents a jewel-box package that makes the perfect gift for any art lover. Copyright(C) All Right is Reserved.